Who hasn’t experienced the dreaded drag of a cooler to your destination whether tailgating, going to a BBQ or a beach. The wheels get stuck. You forget plates. Or cups.The knife you left in the kitchen. Soggy sandwiches. There has to be a better way. Enter The Coolest Cooler, a product that has over 60,000 people screaming, “Shut up and take my money”. First a little background. 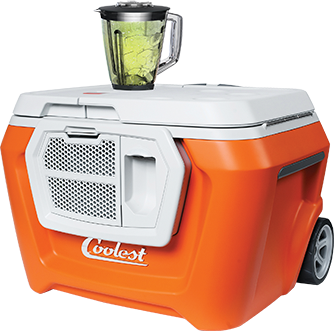 In 2014, an enterprising group from Portland, OR set out to reinvent the Cooler with a campaign on Kickstarter to secure funding. Over 60,000 people responded, ponying up over $13M (as in million) dollars making The Coolest the #1 backed project of 2014 and #2 of all time. Now shipping after a year-long wait, our Coolest Cooler is on order and should arrive in the next 30 days, just in time for tailgating season. We’ll be sure to post a full review once it arrives.